Test Data: From show: .86 BF 10.4 LE at 383 lbs. I love it when Rick Whitman judges a hog show because he builds them from the ground up. Soundness is so important and this guy was the best of the best. Love his color pattern. He is so complete, great feet and legs. Extra big legs, wide based, big thick top, big full rump, lots of rib and center body. Long neck, tall fronted with high head set. Super level topped. Study his rump shot, how thick and square he is down his top. Study his front shot, how wide and square chested he is. 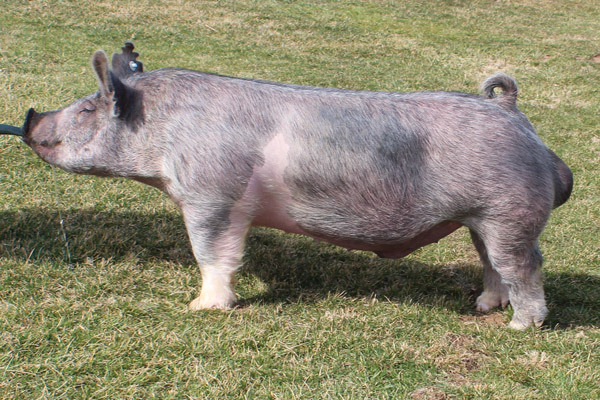 Really good crossbred boar that is as correct as you can make one.